It’s been a while since he was small enough to fit. I swapped out my winter clothing for summer duds a few days ago, transferring each between our master closet and a guest bedroom closet. 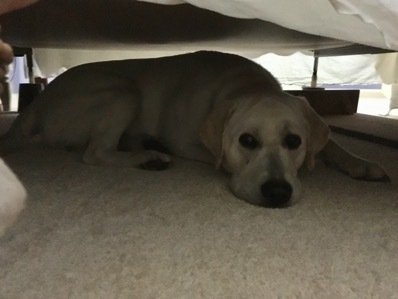 Bodhi followed me upstairs and watched as I walked an armload to the guest bedroom, then promptly dove under the guest bed when he discovered how much room was under there. Once and again, the dog of hidden places.